Power Sweep addition keeps operators out of the bin and the grain flowing. The Buster Bar is Sukup's latest accessory for its Sweepway Power Sweep that allows operators to clear plugged center sumps without entering the bin. Eugene Sukup, board chairman for the company, says farmers in rice country were noting some new varieties of rice would clog in the sump more easily than others. "We needed to find a way to get the grain moving without someone going in the bin. We have to keep people out of bins and away from unloading equipment when it's running," he noted. An electric drill along with modifications recently designed by Sukup Mfg. 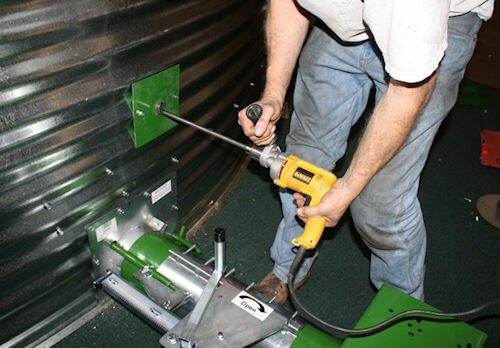 Co., gives grain producers a way to open a plugged center sump in grain bins from the outside. So, with Buster Bar, a tube is mounted to and sits atop the sweep backboard. A small hole is cut into the bin sidewall to align with the tube when it is positioned in front of the exclusive Sukup sweep stop. When it is needed, a rod is inserted through the hole in the bin wall and into the tube. One end of the rod is equipped with a welded section of chain, which extends pas the gearbox at the center of the bin. An electric drill powers the rod, which causes the section of chain to bore into the grain, creating an ever-larger hole, until it breaks up the clump and the grain flows freely again into the sump. The rod is then removed, allowing the sweep to be engaged when gravity unload is complete. Sukup says although the innovation came from rice country, it will benefit grain producers everywhere, and the system will become standard equipment on new Sukup Sweepway unload systems for rice and optional on all others.